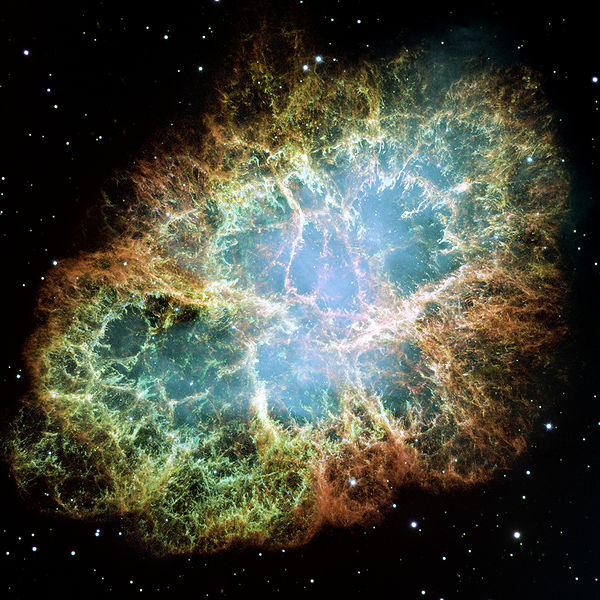 The Crab Nebula, from Wikipedia (image from NASA). I see by today's Western Leader that there's great excitement at Piha in West Auckland. A plaque is to be unveiled on Friday 28 January in Te Ahuahu Road. "Sixty-three years ago high on the hills above Piha two men made a discovery that revolutionised astronomy. New Zealander Gordon Stanley and Englishman John Bolton came to Piha in search of radio stars -- stellar objects that release radio frequencies ... The pair arrived on the West Coast in May 1948 after their search for the stars in Pakiri near Warkworth proved unsuccessful ... 'Bolton and Stanley's discovery revolutionised 20th century astronomy' [so Professor Miller Goss, former director of the Very Large Array in New Mexico, is quoted as saying]. 'This was massive -- the first discovery of a celestial object that was not the sun or the moon.'" Now, the object "discovered" was Taurus A, otherwise known as the Crab Nebula, the remains of a super nova the explosion of which was observed by Chinese and Arab astronomers in 1054. The nebula itself was observed by John Bevis in 1731. According to Ken Kellerman, Wayne Orchiston and Bruce Slee, in thir paper "Gorden James Stanley and the Early Development of Radio Astronomy in Australia and the United States" (2004), Taurus A's radio source had first been detected near Sydney on 6 November 1947, along with that of others at that time. Bolton and Stanley came over to two sites here, at Leigh and Piha to obtain a more accurate position for the sources -- like triangulation. I really hope Professor Goss was grossly misquoted. "The first discovery of a celestial object that was not the sun or the moon"? Come on, Western Leader. Surely you know better than to print something like that? That sentence pretty much tosses out all the observers back to pre-history who have watched the stars or the Milky Way galaxy. I'd term that sentence a major howler -- and hope it was taken out of context. If any readers get a chance to pop out to Piha to photograph the plaque, please do let me know -- I'd love to see it. Update: thanks to Arnold Turner, here are the photos of the plaque. It looks gorgeous, the Crab Nebula, hope you get a shot of the plaque soon. I hadn't realised it was discovered by such close neighbours! The Avondale Spider - you can keep it. And the claim In South Australia this species is quite common, and people encourage them to live in their houses to keep the pest insect population down? Urban Myth, those hairy buggers get no encouragement from this little black duck!